I play the acoustic guitar. I’m not a great guitarist, for me it’s just a hobby, a way to cool down, to take a break from all the crap we deal with every day, to have some limited kind of creative release. I’ve even posted a few videos on you tube: http://www.youtube.com/user/stevetwarner?feature=mhum, mostly to see, after all these years, what I really sounded like. I like to call myself a campfire guitarist. It’s a nice skill to be able to sit around a campfire with friends and family or the fire-pit at our house and be able to bang out a few simple tunes and entertain a hopefully not-too-critical audience. Still the one after all these years! 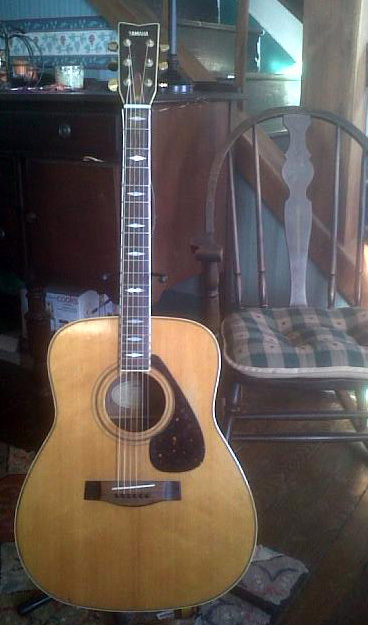 I have played the guitar since my middle brother bought me a used Yamaha six string around 1987 as a Christmas present. It was a gift I hadn’t foreseen, a beautiful blond body, shiny gold pegs, fresh strings that vibrated out beautiful, sensual notes when plucked and strummed. I still play that same Yamaha guitar that he gave to me. I’ve never upgraded it, never thought to replace it. It’s the guitar I built my first relationship with, that I gave my musician vows to, that I touched and held and caressed until I learned to make it sing and it taught me to sing along with it. It’s like an old friend to me, like a beautiful woman who has been, for so many years, by my side, held in my arms, sitting on my lap, hanging around my neck, and helping me make music for over two decades. Envious am I! I love sitting around the fire singing to a guitar man who knows his stuff. That was VERY creative!! You have some imagination! I wish i wish i wish i could play a musical instrument. I am sure that is on my bucket list- but let me go make 100%. I encourage you to pick up an instrument and give it a shot. It’s certainly been a great hobby for me over the years and its something you can do for a lifetime. The guitar is a good choice because you can entertain people, and its pretty easy to learn some basic stuff and you can get a used guitar pretty inexpensively. Piano is a good choice too! I just bought my wife an electric piano for Christmas, she played a little when she was younger and wants to get back into it. Good luck!